Must be 18. Must be 18. Dine in only. Did you know that the drive through at Park Ave is open 24hrs? a. I did not, but I do now. b. That means I can be first in line when the Hot Light comes on at 6AM. Did you know that you only have until Sep 29th to get specialty Pumpkin Spice Doughnuts? a. Yep, been there already to try them. b. I wish the Pumpkin Cheese Cake filled was here through Thanksgiving. c. I know now and will get some of both kinds this week. 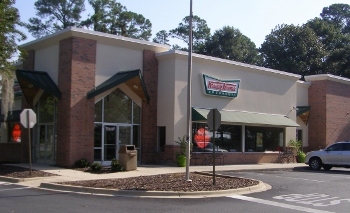 True or False; There is an app for your smart phone that lets you know when the Hot Light is on at your local Krispy Kreme. a. True b. False c. I wouldn't choose 'B' if I were you. Which specialty 'Ghost Buster' doughnut would you choose at either location?